This weekend, September 5-6, the National Buffalo Wing Festival will be making it’s 8th annual appearance at Coca-Cola Field, tempting devotees of our contribution to snack-food history with offerings from over 20 restaurants. In addition to its many gustatory delights, the festival will have entertainment and contests, ranging from cooking demonstrations and wing-eating contests to quiz shows, the Electric Company (Hey, you guys!!) and the Miss Buffalo Wing Pageant. The festival has been a local since it’s inception, and recently has also drawn national media attention from CNN, The Today Show, the Travel Channel, The Food Network, Discovery Channel, and newspapers and magazines throughout the world. Come downtown and see what everyone is talking about, and bring your appetite! If you are ever looking for a relaxing and free evening outdoors, I suggest you mosey on down to the Erie Basin Marina and their beautiful gardens and riverfront walkway. Strolling through the Erie Basin Marina Gardens on Buffalo’s downtown waterfront is a magnificent feast for the eyes. There is plenty of free parking at the Erie Basin Marina and the adjacent Erie Canal Harbor. The gardens accompany a pleasant .5 mile waterfront walkway from the historical Erie Canal Harbor, past the Buffalo & Erie County Naval Park and into the Erie Basin Marina, at which point you can continue onward to the observation lighthouse at the far end of the marina. As you stroll through the gardens, your eyes shift from the beauty and variety of the plants, to the waters and boats of Lake Erie and the Buffalo River, and onward to downtown Buffalo’s skyline mixed with classic architecture and contemporary design. It is certainly an area that’s like none other in Buffalo. The gardens are not only beautiful, but educational as well. On a recent walk through the gardens, I talked to two wonderful caretakers of the grounds. They brought to my attention that the Erie Basin Marina Gardens are a “test” garden for floral and seed companies. Companies test their products to see if they will grow in the Northeast climate. Much like a fashion show, the gardens are sort of a sneak preview of many of the new flowers and plants you see in stores in 2010 and 2011. The beauty of the Erie Basin Marina Gardens and the surrounding landscapes is simply intoxicating. It is a beautiful place that could only happen in Buffalo, NY. 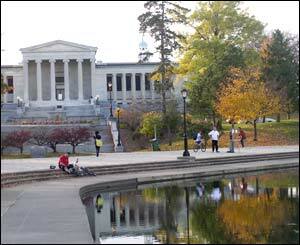 Hoyt Lake at Delaware Park has always been a favorite walkable weekend destination of mine. Close to Elmwood Avenue and neighbored by the beautiful Albright Knox Art Gallery, the lake is a perfectly serene, natural respite from its urban neighborhood. On any given summer Saturday, you can find families with picnic baskets, dog-walkers, bicyclists, and enamoured couples sitting on the steps and grass surrounding the lake, basking in the sun and enjoying the fresh air. Last weekend, my friend and I, with iced beverages from the nearby Café Aroma in tow, decided to make our way to the lake to join our fellow Buffalonians for some much-needed sunshine. This time, however, we spontaneously decided to mix it up a bit and try out the newest addition to the fun of Hoyt Lake — rowboat rentals. While I am something of a connesseur of lakeside sitting and eating, this was the first time I had ever ventured onto the water. The rowboats were a little tricky to get the hang of, but park employees were at the ready to assist with lifejackets, getting in and out, and instructing us on how to paddle. We spent a pleasant half hour paddling around the lake and enjoying the breeze. Once we had safely returned to land, we returned our paddles to the rental hut that had been constructed nearby and bought some snacks there while we were at it. All in all, a simple and fun afternoon excursion. Rowboats are available every day except Monday, and cost $10 per half-hour and $15 per hour to rent. Last Saturday I did a little shopping at Elmwood-Bidwell Farmers Market, which is located in the park that separates the lanes of Bidwell Parkway, at Elmwood Avenue. Both sides of the park were filled with vendors selling a wide variety of seasonal and artisanal goodness, from raspberries, blueberries and tomatoes to pasta, sorbet and sausage. The weather was perfect for a little morning browsing – 75 and sunny, and a string band was there to entertain the customers while they shopped. Everything was so fresh that it was hard not to spend every dollar I had on fruit, but I managed to limit myself to the aforementioned raspberries and blueberries, plus blackberries and tangerines. The great thing about this market is that it’s producer only – no middlemen allowed – so the fruit I bought on Saturday was still growing on Thursday. Try getting that from the supermarket! 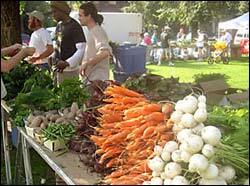 The Market is open 8:00am – 1:00pm each Saturday from mid-May through mid-December. In addition to musical entertainment, there are different demonstrations each week – the next few weeks feature antique creamery equipment and pesto preparation. For more information, go to www.elmwoodmarket.org. This summer the experience of walking down the rear hallway of the Albright-Knox Art Gallery is simply jaw-dropping. For the lack of a more sophisticated phrase, it’s like strolling into the Hall-of-Fame of art, if there were such a thing. The first cluster in the quiet passageway feature names such as, Chagall, Dali, Gaugin, Matisse, Miro, Modigliani, Monet, Renoir, Picasso, and Van Gogh. You don’t even have to be an art expert to realize that those are some of the biggest names in the art world. What is equally interesting is that these paintings are displayed away from the more attentive main entrance…it’s almost as if the Albright-Knox Art Gallery is timid in showing the most acclaimed artists of the past 125 years. Any gallery that features modern art would love to own just some works from this celebrated group of artists. Not here in Buffalo…as all these works are part of the Albright-Knox’s permanent collection. Depending on the exhibitions, you can pretty much guarantee that every visit to the gallery will produce an amazing encounter with the premier artistic talent of modern times. Within a few minutes of entering the gallery, you can understand why journalists and arts enthusiasts have proclaimed the Albright-Knox Art Gallery as being the home to one of the top contemporary art collections in North America. Oh yeah, if those names above weren’t impressive enough, keep walking and you’ll be consumed by the larger-than-life painting “Convergence” by Jackson Pollock, or the fun and whimsical “Campbell Soup Cans” by Andy Warhol. Just another day at the Albright Knox Art Gallery – in one of America’s top arts destinations. 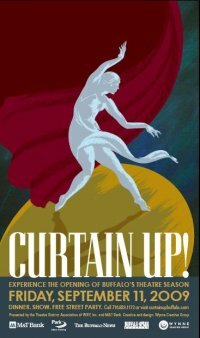 You have a little under a month to start making fabulous plans for the 28th Annual Curtain Up! 2009. Curtain Up! is Buffalo at its best; celebrating the arts and getting together for a fun and classy evening. Curtain Up! is the Buffalo Niagara community’s celebration of the opening of the theatre season. Thousands will gather in downtown’s Theatre District to celebrate the city’s rich live theater scene. The celebration appeals to everyone. From a Creative Black-Tie Dinner to a free street party, you can see what this in on many people’s social calendars. On September 11th, there will be 13 participating theaters offering productions that evening. Shea’s will host the annual Creative Black-Tie Gala Dinner on their stage before the performances. The evening then continues with shows throughout the city starting at 8:00 p.m. Following the performances, a free community celebration will take place in the Theatre District, offering a variety of unique and new entertainment. For a complete listing of Curtain Up! productions and festivities, visit www.curtainupbuffalo.com.